When it came time to start folding the skins of the Xiaolongbao, Mrs. Chen encouraged us to go easy on ourselves. Last week, she said, one of my clients cried because he was having such trouble making them. Xiaolongbao are a type of steamed dumpling from eastern China, specifically from around the south bank of the lower Yangtze in the Shanghai area. 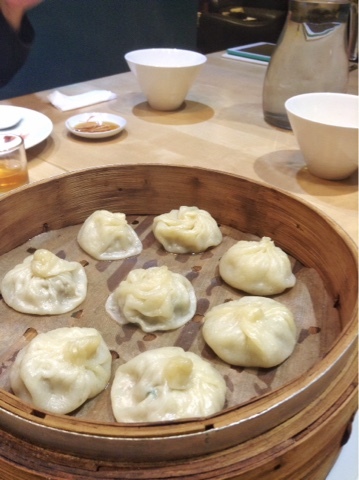 They are sometimes referred to as soup dumplings for the gush of hot liquid that accompanies their filling- a feat accomplished by the inclusion of collagen in the mixture, which is solid when cold and liquifies in the steamer basket. Some iterations of the dumpling are soupier than others, and we've had Xiaolongbao in Taiwan and Vancouver that were completely "dry." Some are made with partially leavened dough wrappers which obviously contributes to a fluffier final product. Din Tai Fung, the most famous purveyor of Xiaolongbao, uses unleavened skins for dumplings that have a thin and delicate texture. Such is the current rage over these dumplings that they're the most commonly requested subjects at Mrs Chen's cooking school. She has been to Din Tai Fung a number of times to get a sense of the operation- the white-coated and masked dumpling technicians plainly visible through plate glass windows as they furiously roll, stuff and fold. Mrs. Chen had already made the filling ahead of time since the process involves cooking pig skin in water, blending the skin and broth until smooth and then chilling it in the fridge for three hours until it solidifies into an aspic. The gelatin gets mixed with ground pork, soy sauce, rice wine, salt, pepper and spring onion and ginger water and then goes into the fridge for 40 more minutes to solidify again. Rolling out the skins, which end up as 9 cm diameter discs that are thinner on the edges than in the middle, is fairly straightforward. The challenge comes when working with these thin shells in combination with the gelatinous filling which becomes wetter as it warms. I can't imagine trying this in a warm, humid kitchen. The folding process is not easy to pick up, either. Basically you gather a small fold along the edge of the wrapper, pinch it to the edge to its left, and stretch the sealed fold toward you and over the filling while gently tamping the filling inside with your thumb. You repeat this, always pinching from right to left until you've gone all the way around the wrapper. The folks at Din Tai Fung perform a set number of folds per piece, but we were lucky to keep the constantly moistening dough from tearing into shreds. No one cried, but we all got a good laugh once we opened the baskets. Here are our flaccid offerings. 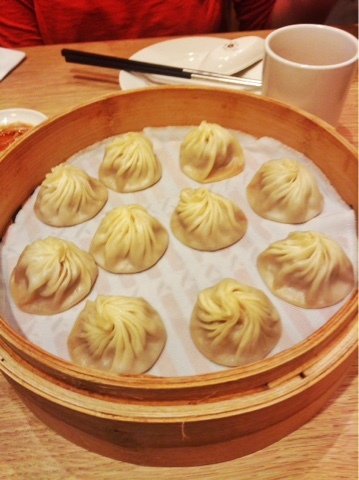 We came away from the evening with a new respect for the art of Xiaolongbao and a determination to up our game.